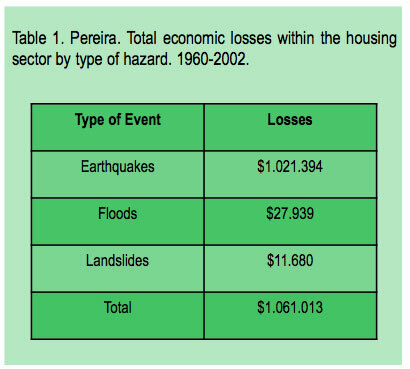 An inter-institutional study conducted in the city of Pereira1 by the Technological University of Pereira (UTP), the Office of Disaster Prevention and Response (OMPAD), of the Municipality of Pereira, and the Autonomous Regional Corporation of Risaralda (CARDER), with support from Colciencias, looked into the impact of disasters caused by earthquakes, floods, and landslides on housing in urban areas between 1960 and 2002. Pereira, the capital of the Department of Risaralda, encompasses 658 km2 and has a population of approximately 400,000 people. Eighty percent of its inhabitants live in an urban area of 29 km2. The city is located along the western edge of colombia’s central mountain range at an altitude of 1,411 meters above sea level, with an average temperature of 21°C and annual average precipitation of 2,750 mm. The diversity of the proposed definitions of a “disaster” reflects the lack of consensus on the topic2 , which, to a great extent, explains the discrepancies found in disaster inventories from different sources and the inconsistencies in the loss of life and property figures reported after such events. The disasters analyzed in our research are not necessarily of such catastrophic magnitude as to be recorded in international statistics, but they did undoubtedly cause many problems in the communities where they occurred. For our purposes, we define disasters as those events that affect the homes of the population, and require the mobilization of relief groups. Traditionally, a disaster’s magnitude is measured by the number of victims or, in other words, by the direct impact on people. However, it is also important to consider that the effect on the surrounding area and especially on housing can be just as serious, given the importance of housing to the population’s well-being. Housing fulfils a variety of functions, as it provides shelter, serves as a family space, proves stability, and indicates one’s status. But also, this space designed and built to be inhabited by people3, takes on a variety of meanings based on the economic status and educational level of the family members. After developing an assessment methodology based on other similar methods found in relevant literature, we set out to select and define indicators that would allow us to assess the impact that earthquakes, floods, and landslides have had on housing in urban areas between 1960 and 2002. Some of our findings are included below. Based on data available for the first three years of this decade (2000-2009), the global estimate of disasters caused by the three hazards mentioned above is increasing. This is explained, in part, by the growing number of people living in areas prone to flooding and landslides, as a result of both poverty and migration caused by displacement. Of these three types of hazards, landslides are the most frequent. Even though landslides affect relatively small, localized areas, they are highly lethal and affect housing and surrounding areas, putting at risk road-ways, and in many cases, disrupting the provision of public services in affected areas. This is not surprising, considering that, according to a study conducted by CARDER, 15% of the total area of this municipality is at high or extremely high risk for landslides, and 48% of its area is at medium risk. Vulnerability to such disasters increases when political groups, taking advantage of poverty, the need for housing, and the weak control exercised over municipal administrations, promote settlements in high-risk areas. The communities most affected by landslides are those with highly sloped areas inhabited by the poorest sectors of the population. Therefore, it is necessary to enhance control mechanisms and develop relocation strategies, since many of these houses are at risk. Land-use plans must be more than mere documents; they must be enforced and become guidelines for the physical development of the city. International studies show that underdeveloped countries are the hardest hit by disasters, albeit with lower levels of economic losses, because possessions may be of lesser monetary value than those in developed countries. This leads one to believe that disasters and their effects are a result of poverty4, not chance, and that poverty creates multiple limitations for addressing these hazards, regardless of their origin. 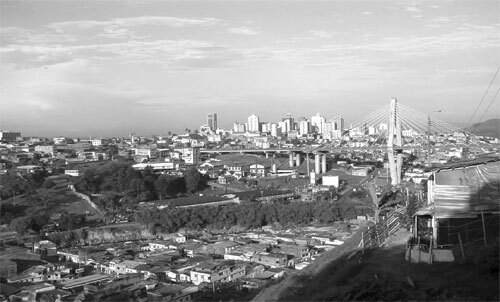 This notion was confirmed by the study carried out in Pereira’s urban area, which demonstrated that houses of poorer families (lower class) suffered the most damage and destruction. Finally, it is important to highlight the economic losses related to the housing sector (Table 1), which can be a hard hit to a relatively small municipality’s development. In comparison with Pereira’s annual budget (500 billion pesos) these losses are significant. All this illustrates the urgent need to raise awareness among the population, especially among those with political and administrative responsibilities related to disaster risk management, given the negative impact of disasters on the region’s development and the well-being of its residents. Blaikie, Piers y otros. Vulnerabilidad. El entorno social, político y económico de los desastres. La Red. Tercer Mundo Editores, Bogotá, 1996. Cardona, Omar Darío. El impacto económico de los desastres: esfuerzo de medición existente y propuesta alternativa. Santo Domingo. Ingeniar Ltda. La Red, ICF Consulting, 2001. Chardon, Anne-Catherine. Un enfoque geográfico de vulnerabilidad en zonas urbanas expuestas a amenazas naturales. Manizales, Universidad Nacional, 2002. Lavell, Allan. Al norte del río Grande. La Red. Tercer Mundo Editores, 1ª ed., Bogotá, 1994. Moreno, Jesús Herney. El impacto de los desastres. Análisis desde el sector vivienda. Postergraph, UTP, Pereira, 2006. 1 UTP, OMPAD, CARDER y Colciencias. “Valoración socioeconómica de los desastres generados por fenómenos hidrológicos, sísmicos y movimientos en masa en el sector vivienda de la zona urbana del Municipio de Pereira a través de su historia”. Pereira. 2005. 2	Shaluf, Ibraim. “A review of disaster and crisis”. In: Disaster Prevention and Management, vol. 12, n°1, 2003, pp. 24-32.